Office window tinting is a valuable addition to your workspace. There are a variety of options to choose from and each one comes with its own set of benefits. Contacting certified window tinting professionals such as Window Tints USA will ensure that you receive the best advice, products, and installation in town! We offer a wide range of options and provide you with personalized window tinting for your office that ticks all your boxes. Why Get Your Office Windows Tinted? Window tinting is vital for your office space. Most offices have lots of windows to let in natural light, invite customers to come inside and to create a productive and cheerful working environment for employees. All this glass means that obtaining some sort of tinting will be very beneficial to the overall space. The livelihood, success and mood of your employees and customers will be improved. Window tinting is, at times, overlooked as an addition that is not greatly significant to your commercial or residential building – but this is not the case. Getting your office windows tinted has financial, environmental and emotional effects on your space. It can help reduce utility bills by keeping the office at a cooler temperature without the need for the air conditioning to be at full blast all day. In fact, having your windows tinted can mean that temperatures are lowered by approximately 15 degrees. The environment also benefits from less AC! The office becomes a more comfortable place with tinted windows which keep out the heat and the glare. Window tinting prevents 99% of the sun’s harmful UV rays and it also reflects heat away from your office space. Window tinting helps to create an eco-friendly, happy office. And it looks good! Make the most of your office and its glass by getting the windows tinted. Window tinting is a great, personalized addition to your office. Depending on your requirements, the film can be tinted, opaque or transparent. Such a variety also means that you have a greater choice when it comes to aesthetics and uses. Window tinting is used on more than just outside-facing windows and can also upgrade the interior design of your office. There are many exciting window tinting ideas out there which will enhance your office from day one of the installation. Window tinting boosts functionality and style in ways that are best suited to your needs. Nowadays, glass is more than a functional and practical element in a commercial space. It also serves a decorative, visually-enhancing function. Having more windows means having a space filled with natural light that appears to be bigger or more open. Decorative window tinting in your office is an effortless way to take the interior design of your space to a whole new level. 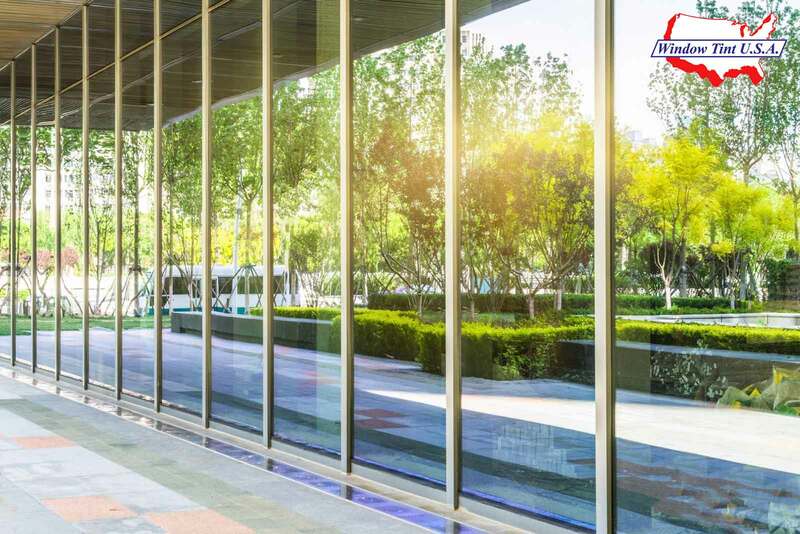 The thin laminated film we use enhances the visual appeal of your office when it is applied to windows or glass walls. You can choose whichever stylish design you prefer, and this really elevates the overall look and feel of the office interior. The decorative window tint can have lovely shapes and patterns. On top of this, you can choose between textures such as rice paper and frosted film for the tint. This is a unique and creative way to advertise your business. Your company’s name, slogan and/or logo can be applied to windows or partitions. Office window tinting looks great and is a practical, easy and visually appealing method of branding and advertising which will boost your business. We have seen fantastic uses of window tinting for privacy. This can be privacy from anyone outside of the office building or it can be for glass walls and partitions inside the building itself. In this instance, office tinting creates partitions and personal workspaces within the office which can lead to happier, more productive employees. Tinting creates the sense of a barrier or wall but in sleek, trendy and customizable ways which will enhance your office. As always, it is essential to contact a certified professional window tinting company who will provide guidance and excellent installation. This ensures that you and your employees (and even your customers!) are happy and protected. Window tinting is a smart investment and it needs to be done right.